VIFF 2018—Talented filmmaker David Robert Mitchell's third, sprawling feature is a seductively surreal mood piece of scrapped together subplots of paranoia, secrets, and conspiracies. 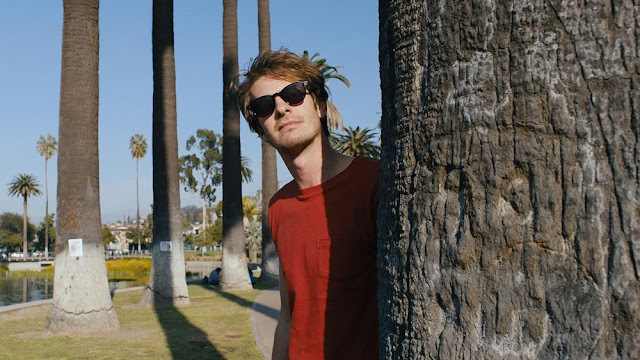 Under the Silver Lake is a hazy mishmash pastiche of modern neo-noir and hipster remix of decadent Hollywood tropes by way of La La Land. Set across the Eastside of Los Angeles, we follow Andrew Garfield as the boyish slacker Sam who becomes an amateur but obsessive sleuth when his starlet neighbour, Riley Keough channelling Marilyn Monroe, suddenly disappears overnight without explanation. His offbeat investigation into the seedy but lavish underbelly of young, affluent party scene uncovers hidden messages and strange ties to the wealthy. The abstract film is populated with amusing side characters mirroring different shady elements of the less glamorous side of L.A. including Topher Grace, Zosia Mamet, Grace Van Patten, and Jimmi Simpson. All of the characters play into updated archetypes that feed into the random but illusive mysteries peppered throughout the densely laid out story. Somehow the narrative manages to be both timely with its hip East L.A. vibe and endlessly nostalgic down to the shot choices, classic film transitions, and stylish post-modern bent. Mitchell doesn't even try to explain anything but only builds a strange, interconnected pastiche of disparate elements that lead Sam into bizarre situations full of sexual detours while indulging his geek hobbies. Mitchell goes too far down the rabbit hole as his shiny sunshine noir riff strays beyond its influences. By its unravelling third act, Under the Silver Lake descends into a shaggy, meandering exploration of its protagonist's own anxieties. There is so much talent and intrigue, but where the interconnected mysteries go with the repeated motifs leads to a series of unsatisfying resolutions. Under the Silver Lake is screening at the 2018 Vancouver International Film Festival as part of the Altered States (ALT) stream.